Presented at Karma Chang Chub Choephel Ling in Heidelberg in 2007. I am very happy that so many people have come to this seminar and want to greet you kindly. There are many reasons why students want to receive Dharma teachings, one being to benefit oneself. Should this be one’s motivation for receiving the instructions, then it’s not bad, but it is rather limited. It’s important to know that Lord Buddha presented the Dharma for the benefit of all living beings, so one’s motivation should be to learn and practice the Dharma with the good of all living beings in mind. This motivation is born from circumstances in that one realizes that one hasn’t been able to experience and lead one’s life as satisfactorily as one would like to and therefore seeks means to experience a meaningful life. Anyone who seeks a way out of misery and frustration needs to know that nobody is alone, but that everyone suffers and wants to be happy. So, the wish to help all living beings is the more encompassing motivation than only hoping to benefit oneself by listening to the Dharma, contemplating and practicing it. I want to ask you to give rise to the vast motivation while receiving these teachings, the vast motivation being the wish to receive the instructions, to learn and meditate them for your own well-being as well as for that of all living beings. Individuals who are not enlightened - people like us - experience suffering of one kind or another. The interesting point is how to become free from suffering. Lord Buddha thought about this many lives before he was born as Prince Siddhartha. During many previous lives he generated the wish to find a way out of suffering and to share his insight with all those who were anxious to attain lasting freedom from suffering. He sought to attain perfect enlightenment not only for himself but for the sake of all living beings. He attained enlightenment when he became the historical Buddha of our times and taught the path to freedom from misery and woe. It’s possible for us to follow the path that he taught. His teachings have not been forgotten and have not been distorted - they have been handed down purely to the present day in an unbroken lineage of transmissions. Therefore his teachings are available to us in a very pure and concise form. When Buddha Shakyamuni attained enlightenment under the Bodhitree in Bodhgaya more than 2,500 years ago, he realized that he could not teach one path only to the many beings who sought his help. He saw that his great number of disciples had varying needs and aptitudes. In order to do justice to their many inclinations and capabilities, Lord Buddha taught an infinitude of methods that are in essence identical and lead to the same result. Meditating Arya Tara is one of the efficient methods taught by the Buddha that leads to perfect enlightenment, presupposing a disciple engages in the practice in reliance on the instructions. Most Buddhas, enlightened beings, and Yidams manifest as men. Tara manifests as a woman for the same reason that Lord Buddha had seen, namely to accommodate the various aptitudes and needs that his many students had and continue having. Many disciples prefer a female Yidam, but in truth the essence of men and women is the same. The difference between men and women has to do with the outer form, which is only valid to a certain extent. As long as disciples prefer a female Yidam, Tara will appear as a woman in many different manifestations. Due to the varying aptitudes that practitioners have, many meditation traditions have evolved in the course of the years, each tradition specialized in a specific aspect of Tara. Also, Lineage-holders of a tradition taught more extensively in a specific area, which also caused the traditions to become distinct. I am only mentioning this so that you know that there is a practice that is right for you if you want to meditate Tara.All this occurred uncountable years ago, and ever since then Tara and all other Yidam deities unfailingly work for the welfare of ordinary beings like us, who again and again become entangled in samsaric ways that bring on suffering. Buddha Shakyamuni presented a great variety of Tantras on Tara and many commentaries were written by renowned masters in the past hundreds of years. They are all contained in the immense collection of texts. And so, there are many traditions that offer a wealth of meditation instructions and liturgies. Buddha Vairocana was the first Buddha to teach the Tara Tantras. He taught the various Tara Tantras in many realms, also in the realm of human beings. Ever since then, the various Tara Tantras are being practiced - they are approaches that do justice to the great variety of differing wants and needs that practitioners have. Some texts are long and complex. Some texts are middle-length; others are short and easy to practice. Whichever Sadhana of Arya Tara a student meditates, it will lead to fruition. Tara has manifested very often as a human being in order to help people in the course of our historical times. Many female emanations have appeared in India, Tibet, and neighbouring countries that adopted Buddhism. Gelongma Palmo, the fully-ordained nun, is one of the most famous emanations of Tara; she is renowned for having had many visions of the Lord of Compassion, Noble Chenrezig, and as a result wrote the text on the fasting ritual that is regularly carried out in this center. The Tara Tantras, which were brought from India to Tibet and that we receive and practice, are either that of Green or White Tara. Noble White Tara prolongs disciples’ lifespan so that they have more time to learn and practice the Dharma in their present life. Noble Green Tara, who is accompanied by 20 Taras (so there are 21 in all), protects disciples from the various afflictions that obstruct them from learning and practicing the Dharma, specifically from the 8 or 16 great fears that are impediments to enlightenment. The 8 main fears are (1) fear of elephants that symbolize ignorance. They were common in India when the text was written and were quite dangerous at certain times of the year, because they would rampage and attack anybody who got in their way. (2) Fear of lions that represent pride. (3) Fear of poisonous snakes that represent jealousy. (4) Fear of the strong current of a river that represents mental and physical attachment. (5) Fear of fire that symbolizes anger and hatred. (6) Fear of ghosts, meaning doubts and confusion. (7) Fear of iron chains that represent desirous grasping and clinging. (8) Fear of robbers, who are similar to wrong views. Green and White Tara are the two main aspects of Tara, but she emanates in many forms and colors that each helps beings overcome particular distressing situations. Green and White Tara, who are the best known, are peaceful emanations who pacify obstacles gently. Forceful Tara manifests when a practitioner is in need of very strong and sudden help. Some aspects of Tara appear in order to help practitioners increase their insight and knowledge; other aspects of Tara manifest in order to subdue enemies. Seeing that the methods of practice vary due to practitioners’ capabilities and aptitudes, there are different practices of Tara in the four classes of Tantra, which all belong to Vajrayana. The four classes of Tantra are Kriya Tantra (“action tantra”), Charya Tantra (“conduct tantra”), Yoga Tantra, and Anuttarayoga Tantra (”highest yoga tantra”). Progressive views, practices, and rituals are taught in the sequence of the Tantras as listed here, each one based on the instructions to fend off coarse and subtle impediments. If practiced after having personally received the instructions and the initiation from a Lama, they all lead to the same goal, the short and concise practice, too, and enable disciples to realize the mind’s true nature. It is understood in Vajrayana that a student has taken refuge in the Three Jewels and has received the empowerment, the oral reading transmission, and meditation instructions from his or her Lama when embarking in the practice of a Yidam such as Tara. The specific Sadhana we are focusing our attention on during this seminar belongs to Kriya Tantra and is a Terma (“treasure teaching”) that was hidden more than a thousand years ago and in the middle of the 19 th century was revealed by a Tertön (“a treasure revealer”) for the sake of receptive students. Authors often concealed their texts for the benefit of future generations; disciples were engaged in other practices that were appropriate for them during those times. Guru Padmasambhava was the author of the Sadhana of Green Tara that we practice. The third prayer to Guru Rinpoche in the Sadhana is a sincere praise to the various aspects that he manifested and is a fervent request that he continues manifesting and guiding those disciples whose aim it is to attain enlightenment in their lifetime and to help all living beings attain the same goal. The prayer likens him to various Yidams and Buddhas and states that he is indivisible with them, specifically with Samantabhadra, the primordial Buddha, with Buddha Amitabha, and with Avalokiteshvara, Chenrezig. The many qualities and amazing activities of his body, speech, and mind are described in great detail in the third prayer of Arya Tara’s Sadhana. At the northwest border of Oddiyana. (You were) born on the pistil of a lotus. Please come forth and bestow blessings. Guru Rinpoche, who is Padmasambhava, was not an ordinary human being. He wasn’t born from a womb, but - according to the legend – he was miraculously born on a lotus that was floating in the middle of Lake Danakosha, which is situated along the border of the Kingdom of Oddiyana. He already had the body of an eight-year old child and was seated in the meditation posture when he was born approximately 1,200 years ago. He wasn’t in need of anything, until one day the King of Oddiyana, Indrabhodi, passed by the lake and saw him. Oddiyana is situated in the Valley of Swat in present-day Northwest Pakistan. King Indrabhodi was a righteous king, practiced the Dharma, and only had the prosperity of his country and the people’s interests in mind. But he had one big problem, namely, he didn’t have a son and therefore there was no heir to his throne. King Indrabhodi had many consorts, but none bore him a son, which worried him greatly. He called all his ministers and spiritual teachers together for a meeting. They recommended that he should go on pilgrimage to the holy Buddhist sites and make offerings to the sacred images and donations to the beggars he came across during his travels so that an heir would be born to him. The king did as told – he spent years travelling and making immense offerings at the holy sites. As a result, his kingdom became impoverished, while no son was born to him. The ministers and spiritual teachers convened again. Legend tells us that there was an island filled with jewels that anyone who went there was free to just take – it had the name “ Jewel Island.” The ministers suggested that the king travel to Jewel Island and bring as many riches home as he could carry so that the kingdom would prosper again. The king did as told and made his way home laden with invaluable jewels. He took another route on his way home from Jewel Island than the one he had taken to get there and arrived in a hidden valley. In the middle of the hidden valley was a beautiful lake. The king saw a magnificent child seated on a lotus that was floating in the middle of the lake. He summoned the king, his ministers, and generals, who were just as overwhelmed by the sight of the child as he was. They were extremely happy and discussed whether the child should be brought to the kingdom. They decided that they had to check whether it would be auspicious to do this, so they called for the king’s astrologer. He told them that the auspicious signs could not be better and that they should bring the child to the royal palace so that he would become heir to the throne. The astrologer said that a child born as miraculously in their own kingdom could only be a sign from the Buddhas. The Buddhist tradition tells us that this child, who became known as Padmasambhava or Guru Rinpoche, was not an ordinary human being born from a mother, but was Buddha Amitabha’s mind appearing in our world in the form of a human being for the benefit of all living beings. It is said that hundreds of years after Lord Buddha’s Parinirvana the Buddhas clearly saw that it was time to send a manifestation into the world to spread the Dharma and guide living beings on the path to enlightenment just as the historical Buddha had done. The Buddhas recognized that Buddha Amitabha needed to manifest an appearance, which he did when he appeared as a child on Lake Danakosha. He became known as Guru Rinpoche, spread the Dharma in myriad ways, and benefited our world immensely. The astrologer, who always advised the king, was informed of the auspicious dream that the king had the night before the child was discovered. He dreamed that a golden vajra fell from the sky, entered his heart, and spoke the words, “A living being will appear in your land and he will bring unthinkable benefits to living beings.” When the king saw the child on the lotus, he recalled his dream and was convinced that he could not serve his country in a better way than bringing the child home and raising him like he would his own son. King Indrabhodi brought the magnificent child to his palace and saw to it that he received a perfect education and was trained to become his heir for the sake of his country and for the welfare of the people. The child was also given spiritual training by teachers belonging to the various spiritual traditions and he practiced the teachings. After a long day of studies one day, the child had a vision of Buddha Vajrasattva, who said to him, “Certainly, you can stay in the palace, become ruler of the land, and this would be the best thing that could happen to the people, seeing they could not have a better king than you. But know that more people in the world need help than the number of people living in this small kingdom. If you stay in the palace and become king, it will be an obstacle for your Dharma practice and for your attainment of Buddhahood. You should leave, become homeless, live as a hermit in uninhabitable places, and practice until you have achieved perfect enlightenment.” Having thought about these words, the boy knew that the ministers and generals would hardly let him go and therefore it would not be easy to leave. He also realized that he was too young to live on his own, so he stayed a few more years, studied, and supported the king and ministers in their endeavour to rule the country justly. At this time, the boy became known as Guru Pema Gyalpo. Years passed and Guru Pema Gyalpo, i.e., Guru Rinpoche, saw that it was time to leave the royal palace and become a yogic practitioner who lived in caves in the solitude of the wilderness and jungles in order to focus all his attention on meditation. He managed to leave and walked towards India. He arrived in a little kingdom called Zahor, practiced meditation there, performed miracles, and became famous as a mighty, realized master. The King of Zahor invited Guru Rinpoche to his palace and asked him many questions, like, “What is your religion? Which meditation do you practice? What kind of teachers do you have? What did you study? And why is it that you are able to perform such wondrous things?” The king was overly happy with the answers that Guru Rinpoche gave. In fact, the king was so impressed that he offered his entire court and country to the wandering ascetic. Everything the king offered him was actually what Guru Rinpoche had turned his back on and had renounced. Not wanting to insult the king, he accepted the offerings as a sign of respect and immediately gave them back to the king. In response, the king insisted that Guru Rinpoche marry one of his daughters. He married Princess Mandarava and she became one of his most famous disciples - they practiced together in solitude and she, too, attained perfect enlightenment in that life. One day a group of ministers and generals from the Kingdom of Zahor found them and - being quite upset that their king had offered his kingdom and given the beautiful princess, who they saw was infatuated, to a wandering ascetic that nobody knew - they took both of them as prisoners. They tried to execute the couple by burning them alive at the stakes. The fire continued burning seven days and seven nights after they ignited it. When the fire went out, the ministers and generals didn’t find ashes or human remains, but they saw Guru Rinpoche and Mandarava, not scorched in the least, sitting in meditation posture on top of a lotus that was floating in the middle of a beautiful lake at the very spot where they had tried to burn them. The king came to see and the evil-doers regretted their horrendous behaviour, asked for forgiveness, and - having realized that Guru Rinpoche was an extraordinary being - they all had great faith and devotion, prostrated to him, and asked him to become their spiritual teacher and guide. As is the custom, they requested instructions from him. Free from holding a grudge and filled with compassion, Guru Rinpoche accepted them as his disciples, placed them on the path of the Dharma, and gave them many empowerments and instructions. It was the custom during those times for disciples to offer presents to their spiritual teacher as a sign of appreciation for having been accepted as a disciple. The king gave him various robes, many insignia, and the lotus crown. Guru Rinpoche is depicted on paintings and statues wearing the presents that the King of Zahor had given him on that occasion. This wondrous event occurred at Tso Pema (“ Lotus Lake”) in Northwest India and is to this day an important pilgrimage site for Buddhist devotees from all over the world. “Until I reach enlightenment, I take refuge in the Buddha, in the Dharma, and in the noble Sangha. “Filled with appreciation, I pay homage to the Sublime One, Noble Tara, and to all the Victors and their noble sons of the three times and who abide in the ten directions. Offering flowers, incense, light, perfume, food, music, and other real and imagined offerings, I pray this gathering of Realised Beings to accept them. I confess all wrongdoings committed since beginningless time through a mind overpowered by negativity. I rejoice in the goodness of whatever virtue Shravakas, Pratyekabuddhas, Bodhisatttvas, and ordinary beings have accumulated in the three times. I pray that the Dharma Wheel – of the Mahayana, Hinayana, and of the teachings common to both – be turned in accordance with the wishes and aptitudes of beings. I pray that until samsara has been completely exhausted, you will not pass away but will look with compassion upon beings sunk in suffering’s vast ocean. Whatever virtue I thus accumulate, may it all be a cause for enlightenment. The first step (referred to as “branch” in the title of the prayer) is (1) making prostrations to the enlightened objects of refuge and then (2) making offerings to them. As stated in the Sadhana, one’s imagined offerings should be limitless. The real offerings are those one placed on the shrine and accord with the ancient Indian tradition of offering a high and respected visitor everything one can think of that pleases the senses; they are a support for one’s imagination when offering an inexhaustible amount of beautiful things. One’s imagined offerings should be like those that Samantabhadra made to the Buddhas and Bodhisattvas aeons ago in that he imagined exquisite presents consisting of flowers, incense, light in the form of candles or butter-lamps, food, pleasant music, and much more and in that he imagined that all these riches filled the entire sky. The third step that one contemplates and recites is (3) regretting all negative actions of body, speech, and mind that one committed in this life as well as in past lives and resolving not to do them again. It’s very important to realize and regret all wrongdoings one has committed, because they are the reason why in this life one experiences suffering, pain, problems with oneself as well as in relation to family members, friends, colleagues, and acquaintances. One’s painful experiences are not caused by anyone or anything other than oneself. Of course, others are involved and it might seem as if they make one suffer the way one does, but nobody brought about anything one goes through except oneself. It would be quite foolish to step back and point one’s fingers at others, saying, “I’m innocent. It’s their fault that I suffer.” Seeing that one created the causes of one’s present suffering during past lives - even though one cannot remember - it’s common to think that others make one suffer. Realizing that one creates one’s own suffering and knowing it’s in one’s own interest to stop creating the causes for one’s future misery makes it easy to resolve not to repeat wrongdoings anymore. Before sitting down to recite the Sadhana, it’s very important to reflect the truth of karma, “cause and effect.” Having made prostrations and offerings and having regretted and confessed one’s misdeeds, one resolves not to repeat them. The fourth step to accumulate merit is (4) rejoicing about the good that all Buddhas, Bodhisattvas, Shravakas, Pratyekabuddhas, and ordinary beings like us have accumulated in the past and present and will accumulate in the future. One rejoices in anything virtuous and beneficial that has been done by oneself and others, instead of being jealous and filled with misgivings. The fifth step is (5) requesting Arya Tara, the Buddhas and Bodhisattvas of the three times and in the ten directions, to turn the incomparable Wheel of Dharma, i.e., to teach the Buddhadharma according to disciples’ capabilities. This means to say that one asks them to teach the Hinayana to those who can only understand and practice it and to teach the Mahayana to those who are receptive and ready. One also asks them to teach the Vajrayana for the benefit of those who can understand and integrate these highest teachings in their lives. The next step is (6) fervently asking Arya Tara, the Buddhas, and Bodisattvas to please stay, i.e., not to withdraw into Nirvana that they have realized, not to forget or neglect beings trapped in the ocean of samsara, but to continue teaching and guiding living beings on the path to freedom from suffering. Reflecting and reciting “The Seven-branch Prayer to Arya Tara” from the depths of one’s heart should not be done mechanically, rather one needs to understand the meaning of each word. It’s important to contemplate and recite the prayer as often as possible. By dedicating the merit for the welfare of all beings, one will certainly benefit all those one holds in one’s mind and as a result the merit one accumulated will be immeasurable. An explanation on how to continue practicing as taught in Kriya and Charya Tantra follows. Let me say that one should practice after having washed oneself and after having arranged a nice environment. It’s important not to have consumed alcohol or meat before engaging in the practice, which is why it’s advised to practice the Sadhana of Tara in the morning. It’s also recommended to learn the melodies of the liturgy. If one can’t, then one speaks it. Since specific melodies have been composed for Terma texts, one shouldn’t sing other melodies. One makes offerings to the representation of Tara that one placed on one’s shrine. There are eight general offerings – water, flowers, incense, light, food, drink, and so forth. One also makes a Mandala offering, similar to the one made in Ngöndro, which symbolizes the entire universe and its inexhaustible riches, multiplied many times. In the course of the Sadhana, one repeats “The Seven-branch Prayer” and makes offerings to the Three Jewels and the Three Roots, which are the Lama (who is the source of blessings and inspiration), the Yidams (who are the source of accomplishments or realizations), and the Protectors of the Dharma (who are the source of activities and include the Tertöns). The recitation of praises after having made offerings is carried out in the same sequence in most liturgies. One praises the Three Jewels and Three Roots for their untiring and ceaseless, compassionate Buddha activities. One asks them to subdue obstacles and its causes and to create good circumstances for one’s Dharma practice. One then makes offerings to the 21 Taras, recites “The Praise of the Twenty-one Taras,” makes a Mandala for them, repeats the praise, makes offerings to them a second time, and recites the praise a third time before continuing. The Sadhana explains the benefits of meditating Arya Tara correctly and states that a successful practitioner will be free of the 8 or 16 kinds of fear and will be fearless. Past and present wrongdoings will have been purified, and one will be perfectly protected by Tara, especially from falling into one of the lower realms of existence in a next life. Even poisonous food one has consumed doesn’t affect one anymore if one recites the praise to Tara. Present and oncoming suffering that is due to hunger and thirst, wars and plagues, sicknesses and diseases, and ghosts and demons will be vanquished if one recites the praise to Tara many times. Furthermore, if one wants to have a child, one’s wish will be fulfilled, and if one wants to become rich, one will. All wishes will be fulfilled if one recites the praise to Tara. One will receive the inspiration and blessings of millions of Buddhas and, by integrating the teachings in one’s life, one will attain complete Buddhahood. In other words, it’s extremely beneficial reciting the praise to Arya Tara with openness and sincere devotion as often as possible. Having practiced the next stages, which are offering a Torma (“ritual cake”) to Green Tara, who represents the lotus family of Buddha Amitabha, having made praises and offerings to her, having requested her protection from obstacles and devastations, having requested her help so that the teachings remain and spread and so that everyone progresses in their Dharma practice, and having recited the auspicious wishing prayers, one imagines that one has become a child of Arya Tara and sees her as a mother. I want to mention that the practice carried out up to now is called “the creation phase.” The creation phase consists of meditating holy images created by one’s mind and making an immense amount of most wonderful offerings to them, praising them, and requesting that they help all sentient beings. After repeating the mantra as often as possible, one acknowledges that one wasn’t able to carry out the practice perfectly, e.g., one realizes that one recited the Sadhana and repeated the mantra too fast or too slowly, became sleepy, and so forth. One purifies any mistakes one made during one’s practice by reciting the 100-syllable mantra of Dorje Sempa. One recites auspicious prayers of well-wishes, called “Tashi Shog.” If one has time, one can recite more prayers requesting blessings. If one has even more time, one is free to recite the auspicious prayer that the sacred teachings last and spread more and more. Every disciple who sincerely practices the long, middle-length, or short Sadhana of Arya Tara receives the full blessings and inspiration that Noble Tara bestows, which benefits all living beings. Thank you very much. establish the levels and grounds of Buddhahood. In reliance on the German translation of the Tibetan kindly offered by Thomas Roth (who is also on the photo that was taken at the center) translated into English and edited by Gaby Hollmann, responsible for all inadequacies and mistakes made here. ”Thanks” to Hans Billing for having made the recording available to us. 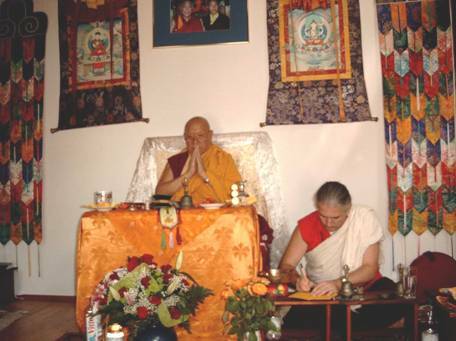 Copyright Chöje Lama Namse Rinpoche, Karma Chang Chub Choephel Ling in Heidelberg, and Lekshey Ling Institute in Nepal, 2008. May goodliness and truthfulness increase!